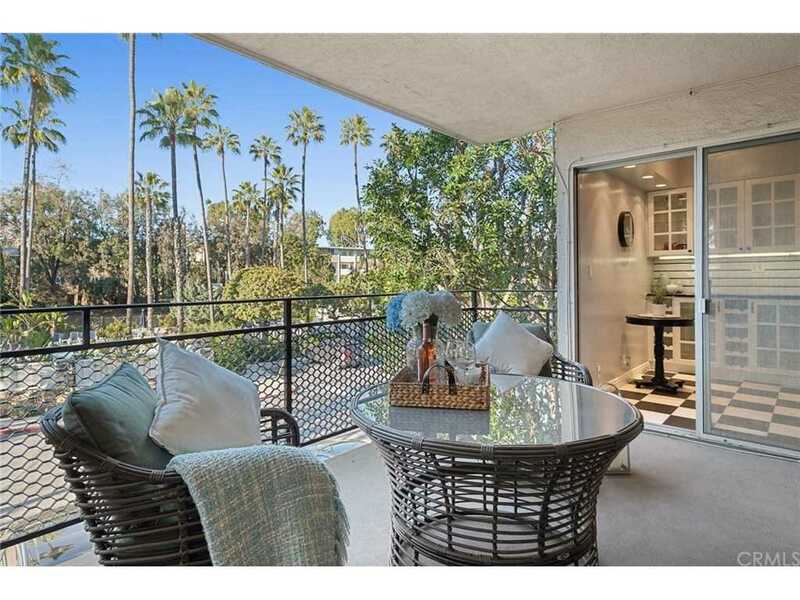 Enjoy a rare opportunity to own a fabulous spacious condo in the heart of Brentwood Village. Located in 5 acres of landscaped grounds with ponds, a large picnic area & ample parking; a serene atmosphere that is almost impossible to find. This resort like setting features two beautiful pools & a spa. Situated within walking distance to shops, restaurants & parks, & only minutes from the UCLA campus & the 405 Freeway. Enter this quiet front unit & you will be amazed by the spacious, light & large open floor plan, with views to the pools & lush landscaped gardens.The flowing living room not only boasts an ample dining area but also has a large bonus area ideal for an office. Sliding doors allow access to the spacious, enclosed & very private sunny patio - perfect for entertaining family & friends.The dining area is a good size & the fully remodeled kitchen, with quartz countertops, allows space for a breakfast table. Sliding door to the private patio too allow easy access for those BBQ days! The large bedroom features a custom built walk-in closet, a second closet & sliding door access to the patio. The spacious remodeled bathroom has a separate shower & bathtub, dual sinks & marble countertop. Secure garage parking, with extra storage, A/C, recessed lights, plus much more - an opportunity not to be missed! Lot Size: 4.34 Acres / 188837 Sq. Ft.
SchoolsClick map icons below to view information for schools near 289 S Barrington Avenue #A203 Los Angeles, CA 90049. Listing provided courtesy of Sally Whitty, Palm Realty Boutique, Inc..
Home for sale at 289 S Barrington Avenue #a203 Los Angeles, CA 90049. Description: The home at 289 S Barrington Avenue #a203 Los Angeles, CA 90049 with the MLS Number SB19017865 is currently listed at $655,000 and has been on the Los Angeles market for 70 days. You are viewing the MLS property details of the home for sale at 289 S Barrington Avenue #a203 Los Angeles, CA 90049, which includes 1 bedrooms, 1 bathrooms and has approximately 1032 sq.ft. of living area.